Kick-start your day with a healthy breakfast recipe. Looking to add another healthy recipe to your breakfast collection? Well, this surely is going to be a great start. Poha or rice flakes is a healthier alternative to many things normally used in Indian kitchens. This makes even diabetes-friendly recipes. My diabetic parents-in laws have poha as a snack in the evenings. 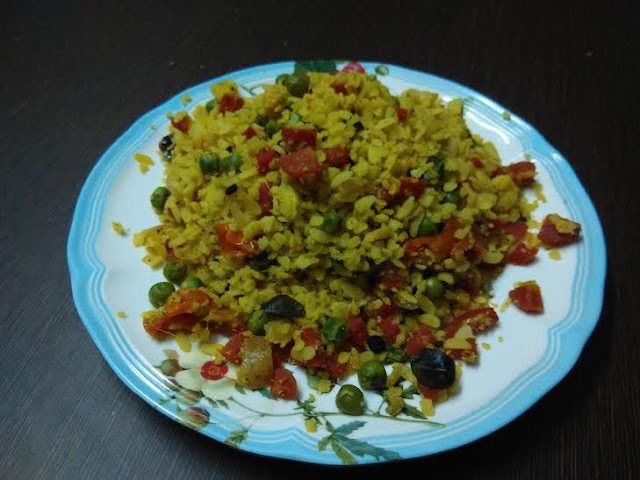 Here I am sharing two poha recipes - perhaps poha upma recipes that are unlike the kind of upma you have been having until now. The first simple breakfast recipe uses steamed veggies. It is as simple as steaming vegetables of your choice, say carrots, peas, capsicum and then adding them to a tempering of onion, tomato, and ginger. Finally, your poha upma is ready when you mix pre-soaked poha. Done! So simple; yet so yummy and healthy! I started eating poha a few years back after I found its varied uses as a snacking option and healthy breakfast alternative. Here is a very simple, filling, and delectable way of enjoying poha. Soak poha in whey/curd/ buttermilk or plain water for 5 minutes. Squeeze and drain. Keep aside. Add mustard seeds, chana dal, urad dal, curry leaves. Next fry onion. Let it turn pink. Add salt, haldi, and green chilly. Add roasted almonds if you want. You may add garam masala if you so wish. Now you can add veggies of your choice. I used steamed veggies and fried them for 5 minutes before adding poha. Garnish with coriander leaves. You may sprinkle lime juice as well for a tangy twist to poha. Enjoy this healthy breakfast option. Here are other healthy breakfast recipe ideas. 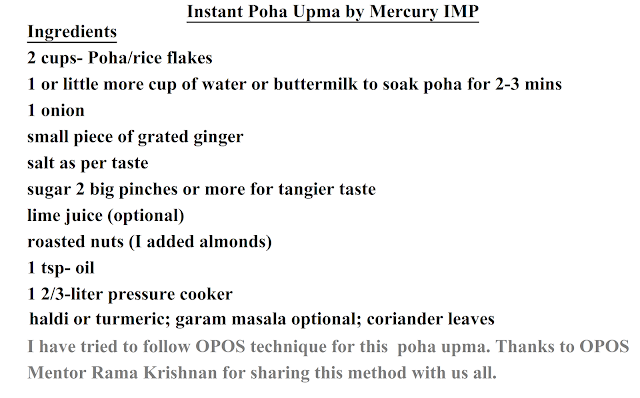 The second poha upma OPOS recipe is even better - healthier, yummier, and easier! Doesn't that make a must try recipe for upma with poha? 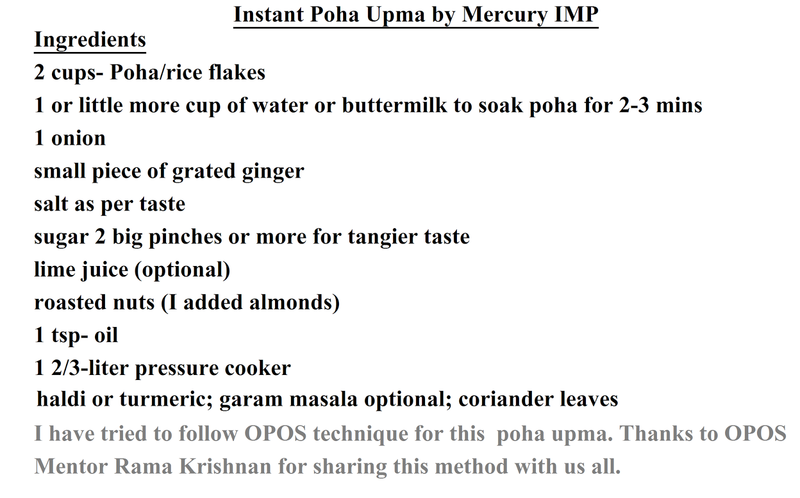 Perhaps you will be doing a big mistake if you do not try this instant poha upma out! I have followed OPOS method shared by Rama Krishnan, OPOS mentor, with my own modifications. Soak poha in water for 5 mins. Chop one onion. Keep aside. Grate ginger and green chilly if you want to add. Dry roast nuts if you do not have them handy. Take a 2/3-liter pressure cooker, add oil. Throw in cumin seeds and sliced onion in the first layer. Then drop in grated ginger and potatoes. Next add salt, sugar, turmeric, and nuts. Finally, add 1 tsp of water and close the lid. Cook on high for 5 mins/2 whistles. Open the lid immediately and stir in the soaked poha. Sprinkle lime juice and coriander leaves. 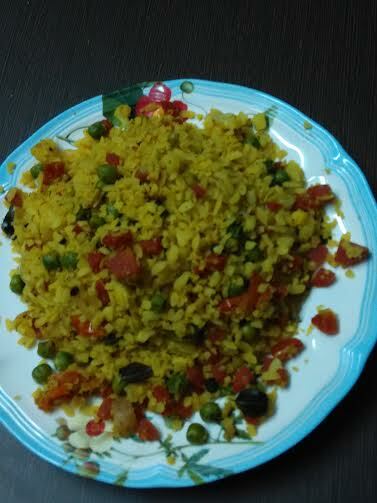 Enjoy yummy, tangy instant poha upma.